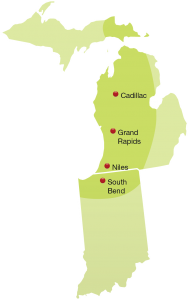 We provide service to most of Michigan and the greater South Bend / Northern Indiana area from Grand Rapids, Niles, and Cadillac. Our technicians are dispatched from Grand Rapids, Niles/SouthBend and Cadillac. We also provide AAADM inspections for automatic doors on an annual basis. These take place at the request of the customer according to the recommendations of the American Association of Automatic Door Manufacturers. All our service technicians are AAADM Certified. Automatic Door Service is a member of these fine Associations.